1. In Restricted Shipment – So called first delivery phase. This phase starts by stated release-to-customer date. By this data software can be used in production environment. Meaning that SAP is providing support to it by issuing SAP Notes and Support Packages. Basically this phase follows by sub phase In Restricted Shipment Planned. Restricted Shipment phase is driven by SAP Ramp-Up program, which is process for launching new application releases into market with support and development involvement. Customer can participate in SAP Ramp-Up to be an early adopter of this software. 2. In Unrestricted Shipment – So called second delivery phase. After completion of Rump-Up program unrestricted phase is next. This happens usually several months after the release-to-customer date. This date is called default release date. During this phase, all customers can obtain the software. This phase follows by sub phase In Unrestricted Shipment Planned. 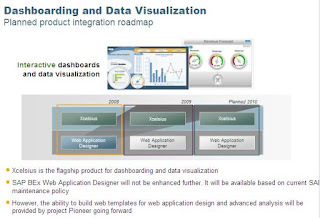 You can observe all of those phases in SAP’s Product Availability Matrix (PAM) on OSS. For explanation of terms related to Status and delivery date of patch see this post. 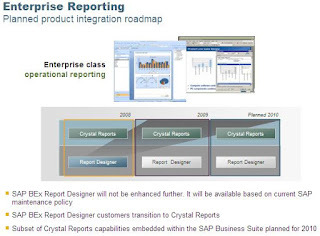 Version 7.20 is supposed to be released on 15th of Feb 2010 as part of SAP NetWeaver 7.2 which is in “Release to Customer” status as of December 2009. BW 7.20 is coming with a lot of new features. 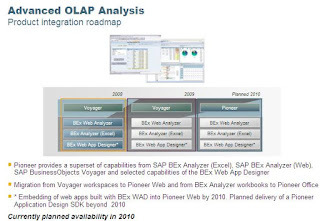 So what’s new in SAP BW 7.20? All details can be found at SDN presentation. 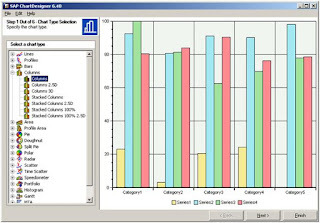 SAP Chart Designer is a tool for defining customizing settings for the Chart Engine XMLCHART) of the IGS. You can model your new graph within this tool with all its properties and layout settings e.g. chart type, enter texts for the titles. Then you save your graph in this tool as XML file. You can now use this XML as the customizing input for your IGS chart, for example in your BSP application when using . You can download this tool via SDN at this page. There are two version of this tool depending on version of IGS: ChartDesigner640.exe and ChartDesigner700.exe. Some videos are available on youtube as well. 1. 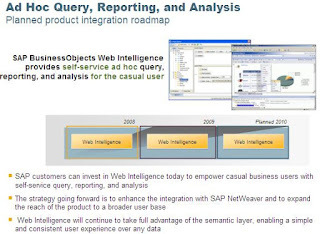 Integrated business analytics – More and more business analytics will continue to be integrated with SAP's products. E.g. financial applications will be added with tools allow users do on the fly calculation and analysis regardless of where un/structured data resides. 2. On-demand computing - SAP plans for year 2010 are to release an on-demand Supply Chain Management (SCM) app., sales automation, travel and expense, services management and an app. 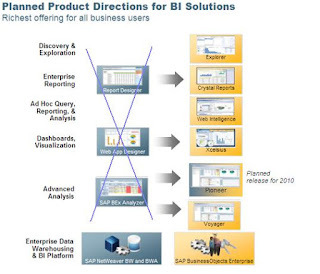 called project Kona that will allow users to quickly adopt BusinessObjects (BOBJ) software. 3. Cloud architectures – Currently this is the most painful area. SAP is very late with their SaaS application Business ByDesign (BBD) which is still not stable enough to be rolled up for regular sale to customers. Anyway SAP is saying that they are still quite calm about “clouding” and they see sense of it only for small customers while those bigger one are not willing to step up the cloud and to replace their current apps. Therefore here SAP is advising kind of “stepwise-migration” approach to cloud computing. 4. Flexible pricing – We could see kind of problems with maintenance fee (enterprise support) this year. SAP was trying to increase those fees while several users’ groups were strictly against it. It seems that SAP is fully aware that this is not a proper way how to treat customers and new pricing models will be introduced soon. E.g. “pay as you go” for customers as they grow with their SAP applications or “term/subscription -based” licenses. 5. Mobile and in-memory computing – Mobile apps. are penetrating everywhere and there must be an information supply for those app. That’s why SAP seems these demands and trying to supply it. On other hand in-memory computing is just continuation of SAP’s vision of real-time computing (see book Real Time: A Tribute to Hasso Plattner). SAP started to accelerate their SAP BW system by new technology where data of data warehouse are stored persistently in operational memory of servers. Here it seems that they see other area where similar concept can be used. This is just a small update of integration of Business Objects (BOBJ) and SAP BW products with regards of reporting tools. For details of all product portfolios see my previous post. All screenshot are taken from this year’s TechEd session BI200 Business Intelligence Roadmap which is accessible for free at SDN. Are you planning to migrate from JAVA compliant application servers (like IBM WebSphere Application Server, Apache Tomcat, Oracle (BEA) WebLogic Server, Sun GlassFish Enterprise Server (Sun Java System Application Server), JBoss Enterprise Application Platform, etc.) to SAP NerWeaver AS? Process – goes through scoping an issues and risks to estimation effort to migration as is self. Services – There are several different services that can SAP be involved in migration. Resources – useful links to helpful for migration. Whole kit is accessible at SDN site.